A textured version. It still needs work and a reposition. It also needs some cellular scaffolding and some additional texturing, but it's getting better. 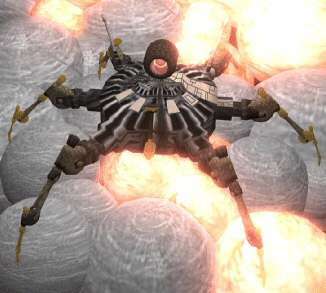 The Nanobot isn't equiped with an air bomb to which can blow up 3 miles of area into nothing. Go ahead and use it for your thesis. You have my permission. This one is my favorite of your work. Very cool! I can't wait to see the final version. The lights on the globes add a ton to the effect.